Tuesday’s vote took place in the lower chamber of the French Parliament. The bill was passed by a large majority, with 438 votes in favor compared to just 86 against. The new piece of legislature had the backing of the two main parties, the ruling socialists and the center-right UMP. The latest bill is one a number of government reports in the wake of the attacks in Paris on January 7-9, which left 17 people dead. France continues to be on a heightened alert and has received threats from jihadist groups, including Islamic State. The bill allows a number of new powers. Private residences can be monitored using geolocation measures, mobile communications can be intercepted and web-page use can monitored using “black boxes;” a complex algorithm that Internet providers will be forced to install. They flag up suspicious behavior and are considered to be amongst the bills more controversial proposals. The bill also removes the need for judicial warrants to deploy hidden microphones, cameras and phone taps. And in exceptional cases spies will be able to use so-called IMSI Catcher devices that can record all kinds of phone, internet or text messaging conversations in a particular area. But rights groups have slammed the new proposals. Felix Treguer, founder of La Quadrature du Net, a group defending cyber rights, warned that civil liberties were being ignored and overlooked. It was also opposed by some leftists and some members of President Hollande’s ruling centrist Socialist Party. “The bill’s advocates wanted a legal framework for the French intelligence agencies, which is a good thing. But the government is actually using the Paris attacks as an excuse for acting against terrorism, but the law is much broader than that. The range of motives that can be invoked to engage in intelligence collection include industrial and scientific espionage, monitoring social movements and so on,” he said. Treguer also warned that the bill is a way for France to keep up with what’s going on in the US and the UK. “The bill is a way for France to retain its rank in the realm of the intelligence superpowers…the bill is a way of continuing the arms race in terms of accumulating new surveillance powers,” he said. French Prime Minister Manuel Valls said that France’s previous law on surveillance dates back to 1991 when there were no mobile phones or internet and so the bill was crucial to deal with the new threats France is facing. Jean-Jacques Urvoas, a Socialist Party MP, said that the bill was in no way like the US Patriot Act passed in the months after the September 11, 2001 attacks. "We are not going for widespread monitoring because the US [case] has shown that to be useless. This is not going to be run on a predictive basis, we simply aim to ensure enhanced monitoring of those identified as threats,” he said. 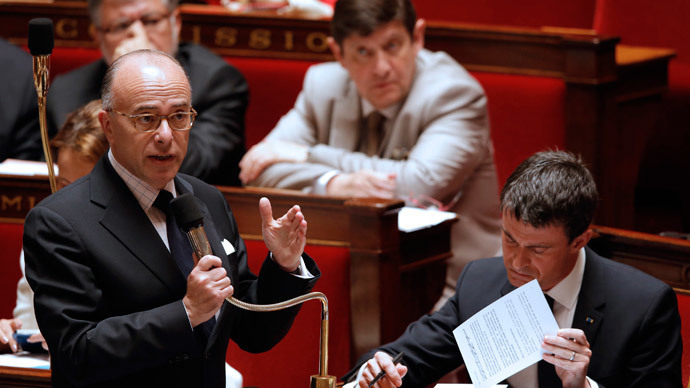 France’s upper house of parliament, the Senate, will vote on the bill in June.